The Divine Liturgy Pew Book is the most complete bilingual Liturgy book to be printed. Featuring the Divine Liturgy of Saint John Chrysostom, this book also contains the audible petitions and responses for the Liturgy of Saint Basil. It includes the complete Thanksgiving Prayers, Dismissal Hymns and Kontakia, Memorial Service, Service of the Typika and a modern Synaxarion, which includes the Saints commemorated in America. This complete Liturgy also includes the Great Fervent Supplication, the Catechumen Prayers and the Litanies of the Faithful (for those who would use them). This sewn leather hardbound book is of high quality, meant to withstand decades of use in the pews. It is printed in red and black and has a very attractive blue and gold foil cover. 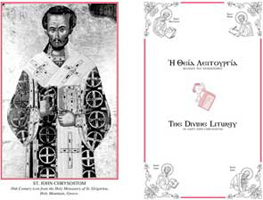 The main reason for the Second Edition of “The Divine Liturgy of Saint John Chrysostom” was the wealth of traditional liturgical music that is now available. The First Edition went to press a year before Saint Anthony's Monastery started their “Divine Music Project.” Contemporaries such as Hieromonk Seraphim Dedes, Vassilis Hadjinicolaou, St. Anthony's Monastery and the Holy Transfiguration Monastery have made the rich beauty of Orthodox Hymnography available to the English speaking faithful. All the above, as well as the group Eikona, have also produced traditional Byzantine recordings based on this hymnography. Rather than try to “reinvent the wheel” yet again with another set of translated hymns when such superior work is available, nor have the faithful seek in yet another book for metered hymns, we chose to replace and add these hymns as necessary in our work. With their kind permission, we have included translations of the hymns of the Divine Liturgy, the Dismissal Hymns and Kontakia by Holy Transfiguration Monastery in Brookline, Massachusetts; Hieromonk Seraphim Dedes; and Saint Anthony's Greek Orthodox Monastery in Florence Arizona. In addition the Greek Orthodox Archdiocese of America's official translation of the Nicene Creed has been included as well, along with a Festal Calendar (commonly known as the Synaxarion). Once your order is received via PayPal you will be contacted for shipping options (not included in the purchase price).